Enzyme-linked immunosorbent assay (ELISA) is a method allowing the quantification of a desired marker in a biological sample. The marker can be an antibody, a hormone, a peptide, or a protein. The quantification of a specific marker using an ELISA-based method can be very advantageous when compared to a more qualitative or semi-quantitative method like Western blotting. ELISA is faster, highly sensitive, high-throughput, reproducible and flexible with the ability to analyze a variety of different sample types of diverse origins. ELISA can also serve as an orthogonal assay format to other methods such as activity assays or Western blotting to further support and enhance previously reported research results. Below is an example of how a p62 ELISA kit can be used to monitor the induction of macroautophagy. MDA-MB-231 human breast cancer cells were treated with 2µM of witharefin A (WA), an autophagy-inducing drug or vehicle. Cells were harvested 6 and 12 hours post-treatment, lysed, and analyzed with our p62 ELISA kit, and for p62 and LC3-II by Western blot. 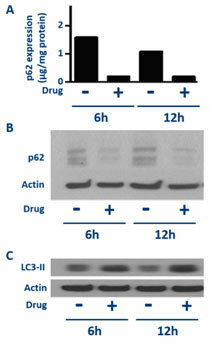 Drug treatment correlated with the induction of autophagy as indicated by the decrease in p62 levels (A and B) and by elevation of LC3-II levels (C). The essential components of ELISA are threefold: an antigen to detect and perhaps quantitate, a specific antibody to this antigen, and a system to measure the amount of antigen in a given sample. The crucial component of ELISA-based detection and quantification is the specificity of the interaction between the marker of interest and the antibody. Enzo Life Sciences’ catalog of nearly 300 ELISA kits includes sensitive, specific, and reliable assays for relevant markers of bioprocess, heat shock response, inflammation and immune response, oxidative stress, signaling pathways, steroid and peptide hormones, and much more. Below, we have highlighted commonly used ELISA assays and their use to determine which is suitable for your research needs. This was the ELISA originally developed by Perlmann and Engvall. The surface of the plate is coated directly with the sample. An enzyme-tagged antibody enables its measurement. Incubation is followed by washing, which removes the unbound antibodies from the medium. The appropriate substrate is then added to the medium, producing a signal directly proportional to the amount of antigen in the sample. This correlation can be used to extrapolate the concentration of antigen in an unknown sample from a standard curve. Direct ELISA is suitable for determining the amount of high molecular weight antigens. Direct ELISA is considered to be the simplest type of ELISA. Fewer steps are required making it considerably faster than other types of ELISA. Cross-reactivity of the secondary antibody is also eliminated. It is, however, relatively rare as the direct labeling of primary antibodies is time-consuming, expensive, and may adversely affect the immunoreactivity of the antibody with the targeted antigen. Indirect ELISA is a two-step binding process involving the use of a primary antibody and a labeled secondary antibody. In this method, the primary antibody is incubated with the antigen-coated wells. Next, a labeled secondary antibody that recognizes the primary antibody is added. This secondary antibody is often a polyclonal anti-species antibody. A wide variety of labeled secondary antibodies are readily available. A substrate is then added to the well to produce a signal amplification. This method is commonly utilized to diagnose infection by bacteria, virus, or a parasite and quantify antibodies against this foreign antigen. Indirect ELISA detection is versatile as different visualization markers can be used with the same primary antibody. Since more than one labeled antibody can be bound per antibody target, indirect ELISA is deemed to be highly sensitive and more flexible than direct ELISA. However, cross-reactivity and a non-specific signal may occur with the secondary antibody. Immunometric assays, also known as sandwich ELISAs, use two antibodies specific to the antigen to capture or "sandwich” antigens in the well for detection. Immunometric assays exhibit a direct correlation between antigen concentration and substrate response. Immunometric assays typically employ a capture antibody coated on the plate to bind the antigen of interest. During a second incubation, the antigen is bound by a second detection antibody that is also specific to the antigen. The detection antibody can either be bound by a secondary antibody-enzyme conjugate, or the detection antibody itself is enzyme-conjugated. 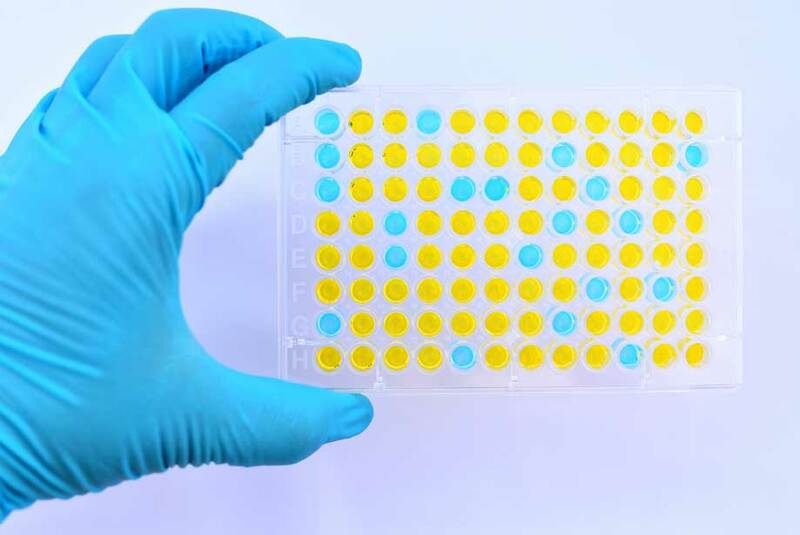 When chromogenic substrate is added to the assay to develop color, samples with high antigen concentration generate more signal than those with low antigen concentration, producing a signal directly proportional to the amount of antigen in the sample. This correlation can then be used to extrapolate the concentration of antigen in an unknown sample from a standard curve. This type of assay is generally used for low-to-high molecular weight proteins, such as Endothelin-1 (e.g. Endothelin-1 ELISA kit), HSP70 (e.g. AMP’D HSP70 high sensitivity ELISA kit), or Survival Motor Neuron (e.g. SMN ELISA kit). Immunometric ELISAs are highly specific as it relies on a pair of antibodies for capture and detection. They are also considered to be compatible with a variety of complex samples without the pre-requisite of sample extraction prior to the analysis. In competitive enzyme immunoassays, the antigen in a sample competes for limited antibody binding sites with antigen conjugated to a reporter enzyme. This produces an inverse relationship between antigen concentration and substrate turnover. Competitive ELISAs typically use a single antibody to a low molecular weight antigen, generally less than 10,000 Daltons. During incubation, samples with high antigen content result in unlabeled antigen being bound in greater amounts than conjugated antigen. When chromogenic substrate is added to the assay to develop color, samples with a high antigen concentration generate a lower signal than those containing low antigen concentration, yielding the inverse correlation between antigen concentration in the sample and color development in the assay. This relationship can then be used to extrapolate antigen concentration in an unknown sample from a standard curve. This type of reaction is one of the few methods possible for low molecular weight antigens with a limited number of epitopes or antibody-binding sites, such as small molecules (e.g. Direct cAMP ELISA kit), peptides (e.g. Oxytocin ELISA kit), and steroids (e.g. Corticosterone ELISA kit). Please contact our Technical Support Team for further assistance. Check out our 10 tips for successful ELISA assay!